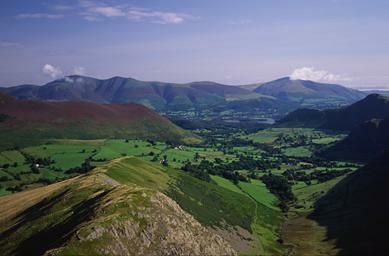 Sun bathes the distant summits of Skiddaw, left, and Blencathra, right, with Lonscale Fell in the middle. Rowling End shows in the middle distance, on the left. The northern ridge of Robinson is seen in the foreground, leading down to High Snab Bank, its continuation. To the right is the nose of Scope End and the spur of Knott End. Beyond that is Catbells descending to Skelgill Bank. Larger version of this picture.